Bath Exhaust Fan Duct Insulation Why & how should we insulate the exhaust duct on a bathroom exhaust fan system? Why & how should we insulate the exhaust duct on a bathroom exhaust fan system? How should we insulate the exhaust duct on a bathroom exhaust fan system to prevent condensation and leaks into the building or wall? This article series explains how to install bathroom exhaust fans or vents, the vent ducting, the vent termination at the wall, soffit or roof, vent fan wiring, bath vent duct insulation, bath vent lengths, clearances, routing, and we answer just about any other bathroom ventilation design or installation question you may have. Insulate the bathroom exhaust vent fan ducts: In un-conditioned space such as an attic, where otherwise your fan duct will be exposed to cold attic air in winter, use insulated solid metal ducting or insulated flex duct. We insulate the bath vent ductwork to minimize the condensation that will otherwise occur as warm moist bathroom exhaust air passes through cool ductwork in the building attic or roof cavity. Our photo above shows a long routing of bath vent fan ducts across an attic floor to an exit at the building soffit or eaves and the condensation of moisture in such vent lines. These ducts should be insulated (or replaced with pre-fab insulated ductwork or flexduct), and a better installation would have shortened that very long duct as much as possible, exiting to a soffit closer to the bathroom. Above we illustrate bath exhaust vent ducting before and after it is covered by a spray foam insulation job in a cathedral ceiling. Watch out: we do not recommend purchasing vent ducts with insulation on the duct interior. Although fiberglass-lined HVAC ducts are widely used in heating and air conditioning systems as well as in heat recovery ventilator systems, for a standard bath exhaust fan vent duct, the combination of permeable fiberglass or other insulating material and very high moisture levels is asking for mold or other trouble inside the vent line. What are two common sources for cold air falling out of a bathroom fan opening in cold weather. The first is wind-blown drafts entering at the vent termination opening. Cure for that is to purchase a properly soft closing vent termination. The second is not caused by outside air movement or wind but rather falling of cold air out of a cold attic vent back into the occupied space. A phenomenon occurs more often with poorly insulated HVAC vents but it can also occur if there is sufficient vertical rise above the bathroom exhaust vent. I had a new house built with a bathroom vent. The duct work travels vertical for 1 ft and then travels horizontal for 17 feet through an unheated attic to a soffit vent. Leaks in cold weather through the vent grill in the bathroom. Replaced the metal flex with solid metal duct, insulated the duct and vent box area in the ceiling with batt insulation. I also replaced the vent fan with the proper CFM requirements. It leaks more now than ever. What I do now? Also, to eliminate the steam during showers, I keep the bathroom door 3/4 open. Dan, Thanks! Love the work. I'm working on replacing the bath fan and duct in my 2-story townhouse, so it looks like my options are routing it through the roof or through the soffit. 1) The previous fan had a 3-in aluminum duct routed to the ridge cap vent. I'm getting rid of it since my new fan has a 4-in exhaust port, but was that an ok way to go? 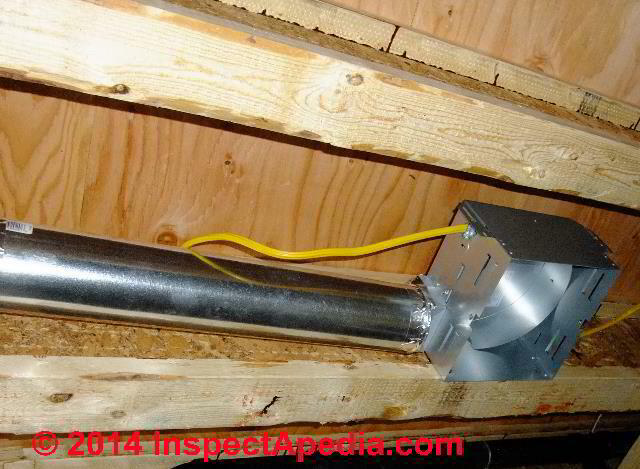 2) The fan housing sits between joists, and in about 12 inches of blown-in insulation. Can I just take an uninsulated duct and bury it in the blow-in insulation out to the soffit? Thanks Hugh, good point. Though external insulation can also mitigate noise in HVAC systems. Another form of fiberglass " lined" HVAC ducts uses simple foil-faced fiberglass panels - making for lightweight, easy to build ductwork that can still be damaged by aggressive mechanical cleaning. Bathroom vent fans usually use metal ductwork or in some older homes flexible plastic (no longer recommended) - distinct from HVAC ductwork and not exposing fiberglass to the duct interior. I don't understand the question; perhaps a photo sent via our page top /bottom CONTACT link would permit comment. Note that fiberglass-lined HVAC ducts are motivated to control noise from upstream equipment and/or air velocity/turbulence in the ductwork. There are better ways to address this for moisture-laden residential bath ventilation. When I removed the covers to all 3 of my bathroom vent fans, I noticed a small portion of the vent was present below the fan. Is this normal and if so, how does it not decrease the efficiency of the fan? IF there were ready access to the flexible plastic fan vent duct you could wrap it in add-on fiberglass insulation sold in strips used for pipe insulation though that'd be a bit thin, or you could if there were space, use 3.5" fiberglass batting around the ducting. Be sure to keep the line as open and straight as possible, and avoid dips that collect condensate. 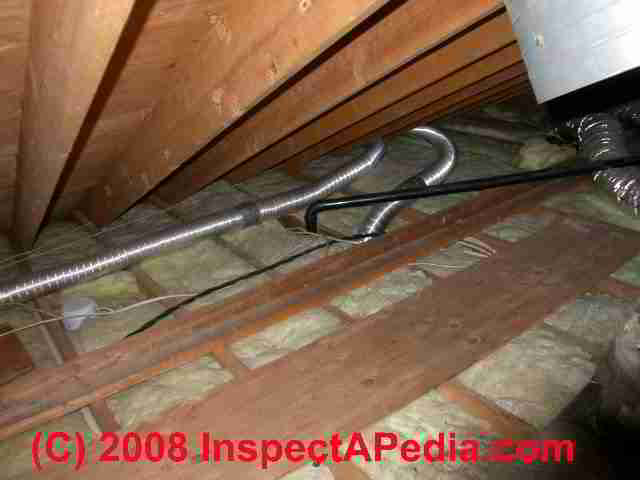 Given the trouble involved it may be less costly and faster to simply replace the ducting with insulated flexible duct. currently i have uninsulated plastic ductwork from from my bathroom fan that runs from the attic out the side of the house. i was hoping to just insulate the existing plastic ductwork. is this possible? Pat, indeed we do find some "straight-up" bath vent installations; in addition to reducing roof reliability by cutting another hole in it (flashing often leaks over the life of a building), any condensation inside the duct will drip back into the fan assembly and ceiling below. I'd prefer to vent downsloping, horizontally, then out through the underside of a soffit if a gable end fall is not at hand. That's not going to be visible from the street; even a vent opening that is visible, properly installed, sealed colored, is not a significant impairment to the aesthetics of a home IMO. If doing the roof tearoff version, when a roof is being torn off anyway, the added trouble to remove and replace a few sections of plywood should not be a significant percentage of the job cost. Clarification: the person in our subdivision with exact floor plan had old ductwork removed, hole in siding on north side sealed up and new ductwork installed with vents exiting through roof on west side slope, front of house, the shortest path up and out. Thanks so much for your comments! The current fans in the master bathroom (in nw corner of house) are directly above the toilet(in an enclosed room) about 12 ft from the north side wall and above the shower, also about 12 feet from north side wall. They are closer to the the west side wall (about 2 ft and 5-6ft respectively), but that is the front of the house, above the garage-you would see them from the street. So the flex duct runs about 2 ft up, curves and then about 12 feet out to exit the north side. Two contractors (both from roofing companies, also do siding) have told me to go straight up and out through roof; only because I think it is shorter run, maybe 3-5 ft. One person wants to exit at roof above vents, which would cause the vents to show on front (west) slope of house. Another wants to exit on east slope of roof (back of house), but vents are about 3-6 ft west of peak (which runs north to south), for aesthetic reasons, so vents don't show on front west slope of roof. Another person in our subdivision had their vents routed in this way, doesn't look so bad, did it last year, survived the polar vortex without problems. So it sounds like the only way to solve without going through room is to have plywood removed when roofing is being torn off (having entire roof redone due to hail) -- it may require several pieces of roof decking to be removed, remove old ductwork, put new ductwork in that is insulated, with a damper on the end (ours has no dampers), but not sure if this can all be done while the roof is being in done in one day? Uninsulated ducts and ducts that drain back down towards a vent fan indeed are likely to give problems with condensation, frost, ice, and leaks back into the interior. I don't like to route vents straight up for the same run-back problem. An optimal design is a vent exhaust that is well insulated, uses solid metal ductwork (best flow), and slopes down towards an exit vent in a soffit or gable end wall. Let's start by asking if the bath layout offers any alternative routes: a fan blowing out through a side wall, for example. As for type of contractor, a general contractor or even a handyman can do the work BUT the risk is that the person doesn't understand the issues or does sloppy work that gives leak trouble later on. Hiring a buiding ventilation expert for such a small job is a difficult prospect: the expert loses money on a small job so either doesn't want it or charges a stunning premium, or takes annoying shortcuts to make the job profitable. You may be forced to become informed about good venting design and then ride herd on the worker to see that the system is installed as you want. Meanwhile don't start an expensive tear-up project before you're confident that the new design is a good one. We have flexible (not white plastic) ducts (uninsulated)that run up and out between cathedral ceiing and roof through the side, in the bathroom. We live in N. IL. and had a severe cold spell this winter; home is original and constructed 13 years ago. Two vents, for shower and toilet run this way, about a 15 ft run. Near the exit on one vent, we have had leaking on ceiling after the polar vortex winter this year, paint peeling off, runs about one foot from the wall inward, and also along line where ceiling meets wall. Also faint water stain about 5 ft in (pooling)? may have had before this winter; and now first year we noticed water dripping from fan above toilet. Only happens in extreme cold. Can't get to ductwork in attic due to cathedral ceiling. What is the best way to fix? 1. Reroute straight up through roof (getting new roof soon due to hail damage, can easily access during reroofing). 2. Tear up ceiling in bath, leave in place, but redo flex duct and insulate? Also, what kind of contractor do I hire to do this work? Thanks!!!! Continue reading at BATHROOM VENT DUCT SLOPE or select a topic from closely-related articles below, or see our complete INDEX to RELATED ARTICLES below. 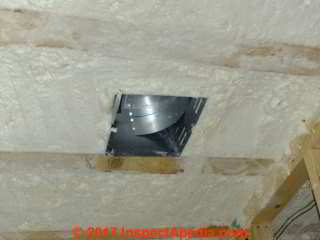 BATHROOM VENT DUCT INSULATION at InspectApedia.com - online encyclopedia of building & environmental inspection, testing, diagnosis, repair, & problem prevention advice.